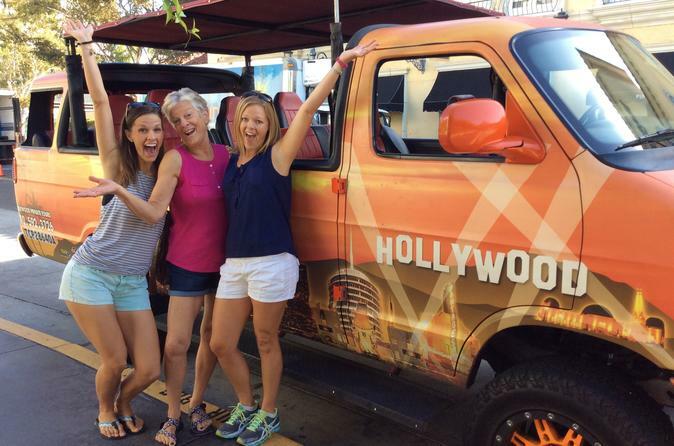 This is a 2-hour Hollywood tour that begins and ends at the beautiful Original Farmer's Market. You will see famous landmarks, locations and celebrity homes. We make 2 stops for photo ops at the Grauman's Chinese Theater and the Hollywood hills to see the Hollywood Sign. Enjoy a 2 hour tour of the “Entertainment Capital of the World”, a fun and entertaining overview of Hollywood’s most famous sites. Your tour is hosted and narrated by LA’s most experienced tour guides and takes you on a fascinating journey through LA’s most famous neighborhoods, past television and motion picture studios, legendary movie theaters, Capitol Records, Hollywood and Vine and the Hollywood Walk of Fame where we make a 15 minute stop for a close up view of Grauman’s Chinese Theater. Your tour will travel into the Hollywood hills to Mulholland Drive where you stop for an amazing panoramic view of Los Angeles, the Hollywood sign, the Hollywood Bowl, the Griffith Observatory, the San Fernando Valley, Universal, Warner Brothers, NBC and Burbank. Numerous celebrity homes and well-known movie and television filming locations are scattered throughout the tour route and your tour guide will do their best to include the celebrity homes you are interested in seeing. Your tour begins and ends at The Original Farmer’s Market, one of LA’s most popular tourist attractions. The Original Farmers Market offers exceptional amenities and parking options with many fun things to do nearby, including an unlimited amount of time to visit The Original Farmer’s Market, Art Museum District, Petersen Automotive Museum, La Brea Park and Tar Pits Museum and soon the new Academy of Motion Pictures Arts and Sciences Movie Museum.